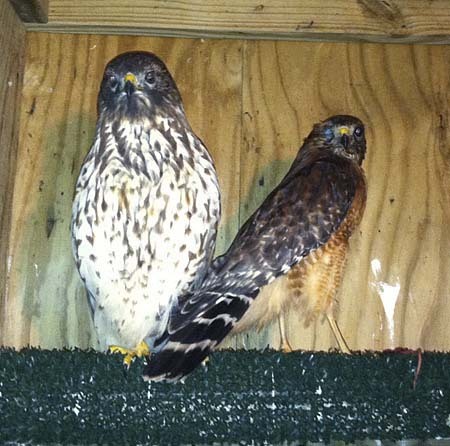 The size difference between female and male red shouldered hawks is plainly visible as Soldier-girl and Rufus perch next to each other. Photograph by Suzanne Shoemaker. A third red-shouldered hawk was added the mix at Owl Moon this week. “Rufus,” an adult male named for the vibrant red coloring of his breast plumage, joined Squeak-toy and Soldier-girl in the outdoor mews last Wednesday. Rufus came to Owl Moon from Second Chance Wildlife Center, where he had received treatment for severe head trauma and damage to the right eye sustained in a collision with a car on November 13. Rufus lost vision in the eye, and is still showing symptoms of brain injury (circling to the right), but, after four weeks, he no longer needs intensive care. Though brain injuries can require a long recovery, there is some hope for Rufus. If he can navigate in flight and catch live prey using his single eye, Rufus may yet be capable of survival in the wild. Thus, on Sunday, December 11, Second Chance transferred Rufus to Owl Moon Raptor Center, where we can house him in an outdoor mews and monitor his progress. Over the next several weeks we will observe and assess his flight and hunting skills. For now, Rufus’s damaged eye is sewn shut. If we determine that he is a release candidate, Dr. Pat Klein at Second Chance may decide to surgically remove his damaged eye beforehand to prevent future infections. If we find that Rufus is not a candidate for release, our choices become more difficult. We will need to evaluate whether his condition and temperament are suited to life as an education bird, and if so can we find him a suitable home. If the answer to any of these questions is no, euthanasia is the only humane choice. The reality of being a wildlife rehabber is often that of making tough ethical decisions. Rufus can’t tell me what he would want. As his caregiver, I am put in the uncomfortable position of having to choose for him. Rufus’ future hangs in the balance, but for now the jury is still out. We will take things one day at a time and hope for the best. Back in the mews the three roommates seem to be getting along well. Rufus is navigating in the mews pretty well. He occasionally miscalculates and bumps into walls, but mostly is able to fly to perches, and he is learning that he needs to turn his head to see well on both sides. Twice a day I instill drops in the damaged eye to prevent infection. I offer him food by hand once a day to make sure he is getting enough to eat. Thus far I have been unable to observe him eating on his own. He eats from my hand willingly, and I only feed him what he takes. Soldier-girl has maintained her “Alpha” status with both of her male companions. I will be watching her weight as well to be sure she is not taking more than her share of the group meal. I am pleased to report that Shredder the great-horned owl is making good progress in flight reconditioning. He is now flying the full length of the creance line, and his flight is nearly symmetrical and balanced. I am feeling confident that after a few more weeks of these workouts Shredder will recover the skills, strength, and stamina he needs for life in the wild. In our physical therapy sessions we can see that he has full range of motion in his mended left wing as well. I don’t expect anything will hold him back at this point, but I have learned from experience it is better not to count your owls before they hatch. I have noticed that with creance flying we see behavioral as well as physical improvements., The birds become increasingly cantankerous as time goes on. I think flying “free” outside the confines of the mews brings out their wildness. They become increasingly frustrated when they come to the end of their line. Fortunately, it seems to work out such that by the time they get truly exasperated and petulant they are physically ready for release. In fact, I have begun to use behavioral cues, along with physical observations, to determine when a bird is ready for release. Some wildlife rehabilitators worry that creance flying may lead raptors to become more habituated, but I have found that the opposite is true, unless it is done in concert with training to the glove. We at Owl Moon Raptor Center wish each of you a joyous holiday season! May 2012 be a happy, healthy, peaceful year for all of us, and for our wild and domestic animal friends!